Paragon Enterprises Inc. and Customer agree that the terms and conditions hereinafter set forth shall govern the relationship between Paragon Enterprises Inc. and the Customer. Customer acknowledges and accepts all such terms and conditions by placing an order for goods with Paragon Enterprises Inc., and upon Customer’s receipt of Paragon Enterprises Inc. invoice enclosed with items delivered to Customer, or upon Customer’s receipt of Paragon Enterprises Inc. credit memorandum or statement, whichever occurs first. You can call TOLL FREE 1-800-758-2955 Monday–Friday 9:00am–6:00pm (EST) to speak with one of our helpful Trade Account Managers. Fax ordering is available. Simply fill out the Fax Order Form, and fax your order to 1-877-321-5700. 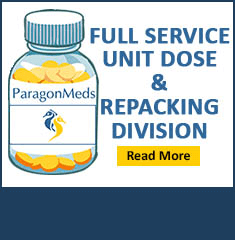 Paragon Enterprises Inc. only sells to those who are legally licensed and entitled to receive prescription pharmaceuticals and other controlled products. If you are a new customer or have recently moved, we must have an updated copy of your state registration and if you plan to purchase controlled substances, we will need a current copy of your Drug Enforcement Administration ("DEA") Registration Certificate verifying the address where the order is to be shipped. By law, the DEA requires us to ship "controlled substances" only to the address appearing on your current DEA Registration Certificate. Call our customer service department at 1-800-758-2955 within 48 hours of invoice date to receive a return authorization. All merchandise must be returned in accordance of all state, federal, and PMDA regulations; a return authorization form must be completed by the customer first before we authorize any returns. Merchandise must be in its original container, unmarked and properly packaged, along with a copy of your invoice and a description of the problem. EQUIPMENT: Opened and used equipment may not be returned for credit. Before opening equipment, we suggest that you check the shipping container and packing list to ensure that you are getting exactly what you ordered. Equipment is backed by the manufacturer’s repair or replacement warranty. Please read and return all warranty information required immediately upon taking delivery of your new equipment. Open or defective equipment will be covered by manufacturer’s warranty. OPENED COMPUTER HARDWARE AND SOFTWARE: Not returnable. Items that cannot be returned to manufacturer for credit are not returnable. Expired products are not returnable. Immune globulin, and all refrigerated products are not returnable. Shortages or errors in shipments must be reported within 48days of invoice date to issue credit (if applicable).